The Dog Behaviour Lady- Guard Dog German Shepherd. Family Pet. Compatible? Guard Dog German Shepherd. Family Pet. Compatible? “I was born to be a guard dog. 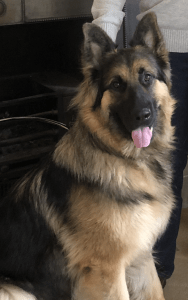 I am an entire male German Shepherd now reaching my prime – eighteen months old. I am ‘The Bodyguard’. My job is to keep my humans safe and to keep safe the environment around them. When we are out, if someone comes too close I warn them Go Away. Lunging and barking has worked so far, but I may need to take it a step further one day. Sometimes the person will look at me and make admiring noises. A hand will come out to over me. How dare they! This is my space. I’m not here to make friends but to protect. Back at home, intruders are a worse problem for a guard dog. ‘Go Away’ when a person is already in and sitting down is less effective. My own humans may shout too. (Are they shouting at me, or at the intruder?). All I can do is to reduce the threat to my humans. If the intruder moves, I shall react. If push comes to shove I will need to bite. A behaviourist lady came to our house yesterday. She sat still and initially I trusted her not to be a threat to my humans. She offered me food which I took and dropped. Does she think she can bribe me to accept her? After a time she took too many liberties. Quite enough, I felt. I charged at her barking. She withdrew. Job done. I can relax from my duties when my humans are not about. What they now want is me to be off guard duty when they are about! But I’m their guard dog. They now want me to trust them with the protection job! Encouraging Bentley to be a guard dog on the one hand, and on the other hand not wanting him to be a guard dog in certain circumstances, means compromise. If they have a guard dog that is a family pet also, he needs to ‘stand down – off duty’ unless told otherwise. This is their challenge. It’s not for me to impose things on the people that are against their wishes, so I must accept that he is to be a guard dog. Normally I would do all I could to reduce the guarding behaviour. Bentley, I believe, is a supremely confident dog. There is no fear involved. To the manner born, he is well in charge of his environment and territory with free run day and night and to a certain extent of his humans too. He is brilliant with the little boy, gentle and playful. The threat is ‘other people’. On walks he ignores people and other dogs, sticking close to his human. He only becomes reactive and protective if someone walks too close and stops, particularly if they move to touch him. Arousal is cumulative and ‘loads the gun’. It was an interesting evening from a ‘trigger stacking’ point of view. My arrival will have sent stress hormones racing into Bentley’s system, topping up those already there. Ignored and brought in on lead, he calmed down a bit. Then they let their excitable smaller dog in which stirred things up. Next, Bentley was returned to the kitchen for a short while so I could move out of my seat. When he came back in he rushed at me, barking just briefly. He was now fired up. A little later I moved my hand to get something from my bag beside me. Bentley exploded. If I had continued rummaging in it rather than quickly withdrawing and keeping still, its possible he would have felt the need to go to the next stage – to bite. It’s only a matter of time if things don’t change. At the very least, management must be in place with Bentley restrained on lead. So that he’s more tolerant, the first thing is to do all they can avoid his arousal levels from stacking up. In addition, Bentley needs to use his brain more to do things for his humans when they ask him to. Working him at home with more training and channelling his guard dog instincts will help to have him under better control when people are about. They will teach him some alternative behaviours. Finding some specialised training in something useful like, possibly, detection work could be perfect for him. Apart from this it’s all about management. People also need managing – both those coming to their house and those they meet when out. Each time he barks, lunges or nips even, in a way he is successful. He is rehearsing the behaviour thus making it more likely to happen again. The dog law now states that if a person feels threatened, even if not bitten, they could be in trouble. It would be a great shame if Bentley be muzzled and on lead only when out. Living in the sticks, they need a guard dog to protect them and their property. If they also want a family pet – to trust a dog with such strong guard dog instincts as Bailey around other people, it’s a challenge. He has to learn when to be off duty and his humans have to step up to the job themselves. This means a complete turn-around for Bentley.